This small four-hectare Mosel wine estate commands a well-deserved reputation for producing consistently excellent, fine wines. 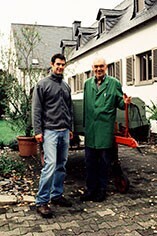 The philosophy of Willi Schaefer and his son, Christoph, is simple: they aim to make their wines as gently as possible, treating the fruit, must and resultant wines with respect. As such, all their wines are treated in exactly the same way in the vineyard and the winery. In the vineyard there is a meticulous attention to detail and all practices are carried out by hand. The emphasis is placed on healthy, balanced vines producing healthy, balanced fruit. At harvest they aim to be flexible, assessing each plot individually, tasting the grapes regularly and picking them at the optimum time. They are incredibly selective, often passing through each parcel on numerous occasions during the four to five weeks of picking. In the winery they work using gravity, an approach Christoph feels is important to retain the nuances of fruit and terroir in the wines. They use a pneumatic press that is gentle, slow and steady, avoiding harsh, phenolic juice. The juice is settled naturally in tanks, then racked into large, old barrels for fermentation. They taste each barrel regularly to decide when it is best to stop fermentation. The same applies during élevage – if a wine needs more time to evolve it remains in barrel, but if it feels ready or it is a fruit-dominated vintage, it may be racked to stainless steel tank a little earlier. The Schaefers believe that fermenting in wood results in wines that are naturally more integrated in character. As such they maintain their barrels with typical care and attention, cleaning them rigorously (and never using any chemicals to do so). The personality of the vineyards comes through in the final wine with clarity and precision. In Himmelreich the fruit is at the forefront and the minerality is less overt, so the wines usually convey a sense of accessibility and immediate pleasure – but they are no slouches when it comes to ageing. The Domprobst displays more overt slate notes, with earthy minerality dominating and a more obviously linear form that clearly needs time to show its full potential. These opposing vinous characters owe their personalities to the soils on which they are grown. The deep, grey-blue Devonian slate soil that they share embodies subtle differences at each site. In Himmelreich it is lighter in texture and structure, whereas in Domprobst there is more shale and stone.